Well it doesn’t contain chocolate, therefore it’s not top on my list of desserts, but its a bit of a staple really! 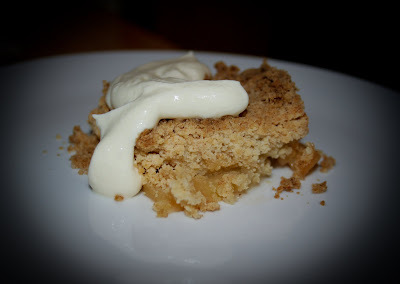 And I had a mighty surplus of apples that were teetering on the verge of ‘I’m not going to eat them, they’ve been on my shelf a week or two’ So I whipped up a heavy on the crumble dish of apple loveliness. And because I am a nice person and I am generous and completely modest, I am sharing with you. I did happen to make way more crumble than was necessary so I scaled back a tad. This may still be crumble heavy for all your crumble amateurs out there, but there’s nothing worse than measly amounts of crumble. Oh also, my batteries in my weighing scales ran out so this is in Cups. 6 – 8 apples- preferably big cooking apples (If very big you can cut back on the amount- 4-5 giant does the trick). 1/2 cup of demerara sugar and 2 tablespoons to sprinkle on top! Preheat your oven to 180 degrees. Grease a nice tin that you would like to put your fantabulous crumble in. Crumble time. Now. I have said I’m a fan of speeding things up, what with my course taking up a lot of time. You can do this nicely in a food processor. Pop in your flour and your butter and give it a whizz until it looks like yummy breadcrumbs. Alternatively you can rub the butter into the flour old style. Cold hands, cold butter, tips of the fingers to rub it in – If I can ever afford a video camera I will show you how to do this and other stuff. Today I was helping Mary shop for almost unheard of audio equipment and I had issues walking by the camera equipment.